Today we at Faber Interactive and KoukouStudios are very happy to celebrate the first year since the release of Lethe: Episode One and a 50% anniversary sale will be running on Steam as part of the week-long deals. If you didn’t have a chance to play the game yet, it’s a great time to try it out now. There have been several updates since day one, including Steam Achievements support and several optimizations and improvements. And some exciting news: The announcement of Lethe 2: Origins. Lethe 2: Origins is our new title currently in development. The game takes place in a remote village on the same island as Lethe: Episode One but 30 years earlier. If there’s one thing that we think we nailed in the first game, it is the atmosphere and that’s something we are passing over to Lethe 2. There’s a great difference between the two games though. Unlike its predecessor, in Lethe 2: Origins, storytelling is the place where everything else meets while gameplay is knitted around it. Another big difference (undoubtedly welcomed by many) is that the world is no longer limited to underground interior spaces. When we started with the development of Lethe: Episode One the story was screaming for further future expansions. That’s when the idea about the episodic approach came along. The plan was to make three standalone episodes that didn’t necessarily rely on each other but in the long run if put together, they would explain parts of the story that in some episodes would remain unclear. Unfortunately even though we were pretty clear about the standalone nature of each episode, people were scared away by it and the episodic part of the game’s title costed us a large number of sales. Knowing that even AAA developers have failed to deliver episodic games before, we don’t blame them. 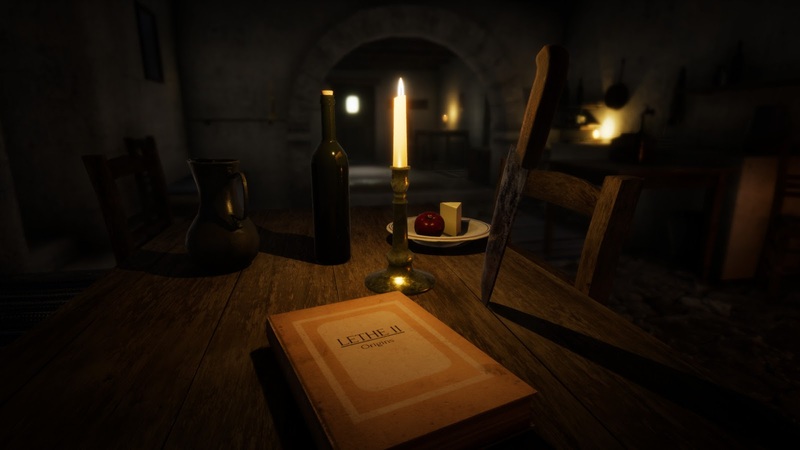 Lethe: Episode One was developed on the Unreal Development Kit. Since Epic Games abandoned the project and moved to Unreal Engine 4, our best bet was to follow suit. Migrating the project to their new tech and developing new features took an extra amount of time, adding up to a new project already detached from Episode One that can no longer be considered an episode. We can’t give away much just yet so let’s leave the topic here for now. There’s more to come in the near future as we push forward through development. Let’s take a look at what happened since August 1st 2016. With YouTube overflowing with search results after typing “Lethe: Episode One” in its search-bar and over 2,6 million views on a single gameplay video by Markiplier, we are more than happy to have invested in the project. Unfortunately the popular press totally ignored the game and not a single of our attempts to contact them was ever replied (Episode One made it to Metacritic but got stuck with just two reviews and never got a rating because of it). Considering that we didn’t have any insiders or the power to fund a place on their pages that was to be expected. On the other hand the medium/small press guys gave us a very warm welcome in the industry and we’re still very thankful. User ratings have been very encouraging too, summing up to “very positive” rating. With Lethe we aimed towards a specific audience interested in slow-paced atmospheric horror. A good number of them embraced our work and offered their valuable feedback for further improvements. Sales haven’t been as pleasing as we hoped for, but a small cult has formed around the title. While the quality standards for Lethe: Episode One are far higher compared to several top indie game sellers for 2016, with 7500+ units sold on PC to date it isn’t exactly considered an indie financial success. Yet, given the size of our team at the time (2 core developers and 3 freelancers) it has done far better than the average median indie game, while in the meantime we are able to keep our small studio running solely on the gas our sales provide. Once again thank you for supporting us in this journey. I believe that the low number of sales can be brought down to three reasons (I’m certainly not an analyst though and I’d be very interested in hearing your opinion on the topic). Lethe: Episode One was never given a proper promotion campaign. We’re a very small studio and by the time we reached that point we had already invested all we had in the production. We went this far thanks to the word of mouth and your support, and we’re very grateful for that. As already stated above, even though we were clear about the standalone nature of each episode a lot of potential buyers were scared away by the episodic title. Some even stated that they like the game but they won't bother buying until all episodes are released. Of course that’s a double edged knife for a small developer like us. Reduced sales usually mean that future releases are less likely to happen. 2010 introduced the second “survival horror apocalypse” in gaming. And alongside the “indie apocalypse” it spread so fast that by the time Lethe: Episode One came out the audience was already fed up with “run and hide simulators”. On top of that Steam is still flooding in extremely poor-quality horror projects. It’s not a wonder that people are cautious when it comes to products by new developers nobody knows. Going for a mainstream horror game by an already popular developer reduces the risk factor of wasting time with refund policies. It’s sad but yes, piracy is a huge issue for us. By the end of 2016 we tracked down an approximated number of 25000 pirated copies of Lethe: Episode One. A number that is already more than three times greater than the current legit sales and rising twice as fast. When considering that with the added income we could have hired a few people to help us with our next production, instead of working an average 10 to 12 (and sometimes even 16) hours a day… Well, it’s disappointing at the very least. Unfortunately there’s not much we can do, other than hope that those people are at least planning to buy the game in the future if they enjoyed it. If we take in account that Lethe: Episode One came out of the blue, without any sort of a promotional campaign and from an unknown developer, we can safely say that it performed fairly well. Though in the long run the financial uncertainty spreads in the air more often than we hope for. It certainly doesn’t help with clearing out our worries and to focus on the development of our next big title, but as long as we manage to keep the number of sales stable until the release of our next installment we’re very positive that everything will end well. As a safety measure though, we're currently also examining possible alternatives when it comes to funding the project. Any suggestions from the veterans among you are most welcome. Πολύ σωστή παρατήρηση. Είναι ένα ενδεχόμενο που επεξεργαζόμαστε εδώ και καιρό αλλά δε θα ήταν καλή ιδέα να προχωρήσουμε σε μια τέτοια κίνηση πιστεύω αν πρώτα δε βεβαιωθούμε ότι ο κόσμος δε θα το λάβει αρνητικά, δηλαδή ότι τους αφήνουμε στα κρύα του λουτρού με ένα επεισόδιο. Ίσως τώρα που φαίνεται στον ορίζοντα το Lethe 2 να είναι μια καλή στιγμή για να ξαναδούμε το συγκεκριμένο θέμα. Το τεχνικό κομμάτι το έχουμε ήδη πάρει υπόψιν και έχουμε συμπεριλάβει τη σχετική υποστήριξη για περισσότερες των μία γλωσσών. Από κει και μετά είναι θέμα καθαρά χρόνου κι αν φυσικά του αν θα έχουμε τη δυνατότητα να συνεργαστούμε με κάποιο άτομο ή άτομα που θα αναλάβουν το localization. Ναι είναι στα σχέδιά μας σε κάθε περίπτωση. I'll promote your game. I bought it seconds after it went live. Then I beat it before the 1st patch. After that I bought 3 copies for friends. I absolutely loved it. I'd be more than happy to spread the word on ep2 and while I don't have the reach of good old Mark I can also make videos about it. Thank you, that means a lot to us! Hope this Lethe 2: Origins will come out soon. Will you consider the idea to heath our spirits by releasing some beta version or a demo version of the game? Will it be another hide & run survival horror game? Last but not least... due to the not-episodic decision to release this game, does it continue the story plot, or will it spin the plot off the main rails? Sorry for the interrogation thing, but I can't wait for the second release. Thanks in advance! Thanks for the warming words! I can't disclose much at this point, other than that I'm currently writing a post that will likely see the light of day somewhere early in the new year.